Beaconsfield | Where Angells Tread! Over the last few weeks we’ve been steadily filling in the ground between the M25 and High Wycombe. Today’s walk starts in Beaconsfield, famous for its model village (warning, model train geeks only!) and not much more. It was too hot for this walk really but we press ahead anyway, me having convinced Sue that most of the walk is in the woods. It turns out that large stretches are in the blazing sun…this summer is turning out to be a scorcher! By the time we reach Chalfont St Giles, and Milton’s cottage, refreshments are badly needed. We stop off briefly for a ice cream. The return takes us by way of The River Misbourne, Jordans and Sear Green. At Sear Green we join Longbottom Lane back to Beaconsfield. The walk could be redesigned to avoid this section…the jumping in and out of hedges to avoid on-coming traffic is not cool. The original walk had avoided this section but we re-routed on the fly to avoid heat stroke and my choice was none too smart. A rather too hot 11.6 mile walk. 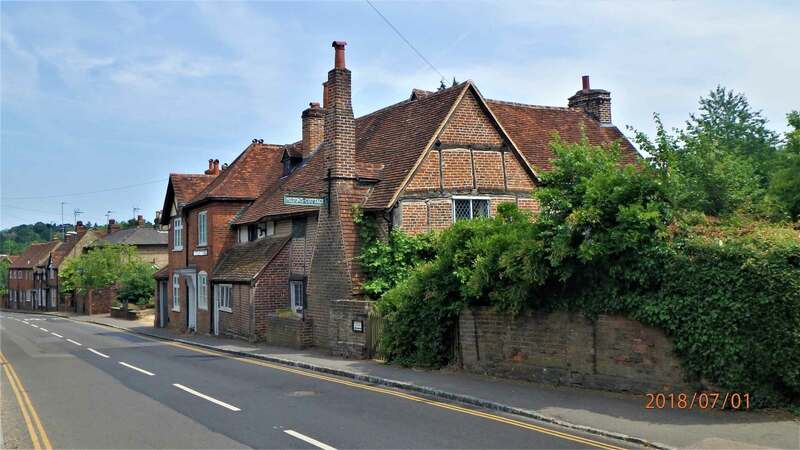 I was in Beaconsfield yesterday and drove back along the pretty country lanes towards Amersham, making a note of the many inviting walks along the way, but will save those for when it’s cooler. Good choice! Walking has become a bit of an addiction for us so we’re making the most of things while it’s not raining. I’ve got really behind with writing them up…finding the time is difficult when we’re either out walking or dealing with a house full of kids back from university.